Clean Your Plate Or Else! You might call Yukako Ichikawa an Asian version of the famous Soup Nazi from Seinfeld. She’s definitely like the Soup Nazi in the fact that her restaurant has more rules than most hospitals. 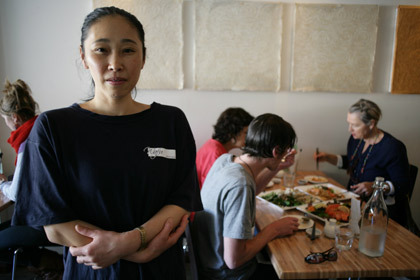 First and foremost at Wafu, the 30-seat Surry Hills eatery in Sydney, Australia: clean your plate. Everything is meant to be eaten, and if you don’t eat it (or bring your own container for take-home leftovers, then you can find yourself banned from the restaurant for not eating your food. However, if you do clean your plate, you get a 30% discount so bring an appetite or bring a friend! That’s not the limit of Ms. Ichikawa’s unusual behaviors. Besides the forced plate-cleaning, the bans, and the discount, she also sends customers away if she’s feeling negative. Her food is also free of gluten, sugar, dairy, eggs, preservatives, and 100% organic. After a positive review of her food brought hordes of new customers to her door, most of whom were food-wasters, rather than simply not serving anyone she didn’t know, she drew up a list of demands and posted them outside her restaurant and, in some cases, on the menu itself.